Name the very first doll you ever bought. Resinsoul Dan that I named Amaya Vershvovski. Which doll do you plan to buy next? Are you currently waiting on any dolls? Not at this moment, hopefully soon. How many dolls do you currently have? Name the very last doll you bought. What is the worst thing about this hobby? I would say the price but that is manageable as long as there’s layaway. What is the best thing about this hobby? The Dolls and the creativity that comes with them. Which is your best dolly photo? I would have to say it would be the one I took of the twins a couple days after they had arrived. 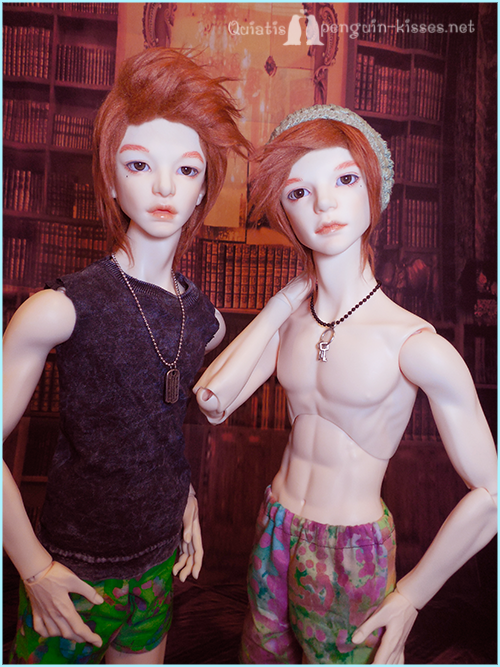 Which is you favorite BJD company? I like quite a few but I would say Iplehouse is my favorite because of their sculpts. Who are on your wishlist? Are there any dolls you wish you hadn’t purchased? No, even though they sometimes give me trouble I would never wish I hadn’t purchase them. They each helped me learn something new (Sewing, Jewelry making, Pattern drafting, Face ups, Restringing and so on…). Who’s your favorite face up artist? What is a must when considering a purchase pose ability/face-up/age/etc? Research, research research… Read up on companies time/reviews/etc.